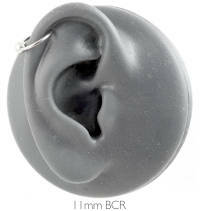 Hypoallergenic surgical steel BCR (ball closure ring/captive bead ring). 6mm and 8mm internal diameter surgical steel rings are closed with 3mm clip-in balls. 7mm, 9mm (5/16") and 11mm (7/16") internal diameter surgical steel rings are closed with 4mm clip-in balls. 1mm or 1.2mm gauge BCRs? 1mm/18 gauge BCRs are good if your piercings have shrunk or were originally pierced with a smaller size. You may find it easier slightly to fit the ball in a 1mm gauge ring. 1.2mm/16 gauge is the most common size ears are initially pierced with and the rings look slightly thicker. They're good earrings but a bit fiddly to close them. Would like to say that every order i have placed... Very happy. I love the all sorts of materials you have... Titanium, surgical steel my fav. One of my piercings kept getting a bit sore so I bought these to keep in and they've been great. Happy ears. Tricky to get the ball in as I'd never used them before, but once in, they are great! A bit tricky to put in but fine once you have the knack of it. I've worn it both cartilage and earlobe and it's very comfortable in both. I bought the 9mm and it's just the right size. Seems very secure too. I hadn't worn earrings much for years as my lobes would get sore and inflamed, and had started to heal up. I have had these in for several weeks. The piercings are no longer sore and I've just ordered the 1.2mm gauge to gently stretch them. They are comfortable to sleep in. It was a little fiddly to fasten them but I feel confident that they will stay put.